Teratomas are the most common germ cell tumors derived from embryonic tissue composed of cells from two or more germ cell layers. These tumors arise in gonads and extragonadal sites such as midline, mediastinum, sacrococcygeal region, and retroperitoneum. Retroperitoneum is an unusual site in adults. Malignant transformation in teratomas is rarely seen only in 1% cases. We present the case of a 57-year-old female patient who presented with abdominal pain and swelling and was diagnosed as adenocarcinoma in a retroperitoneal teratoma. Adenocarcinoma is a rare somatic malignancy arising in a retroperitoneal teratoma. Extensive literature search revealed <20 cases and our patient was unique in presenting at a later age. A review of the current literature is also done. Germ cell tumors are classified as seminomatous and nonseminomatous tumors. Teratomas are nonseminomatous tumors composed of cells derived from two or more germ cell layers. Teratomas rarely arise in extragonadal sites such as midline, mediastinum, sacrococcygeal region, and retroperitoneum, of which retroperitoneum is an unusual site. These tumors constitute 1%–11% of all primary retroperitoneal tumors., Retroperitoneal teratomas occur in infants and young adults and it is rare in older age group. Malignant transformation in a teratoma is seen in about 1% cases where a somatic malignancy arises in a long-standing case. Most common histological type of somatic malignancy to arise in an ovarian teratoma is squamous cell carcinoma (75% cases) followed by adenocarcinoma and carcinoid tumor. A 57-year-old female presented to the outpatient department with complaints of abdominal pain and mass per abdomen. Contrast-enhanced computed tomography (CT) scan showed a retroperitoneal cystic lesion close to the body of the pancreas with thick enhancing septa suggesting the possibility of mucinous tumor of the pancreas. Her serum amylase was toward upper limit of normal (83.5 U/L; normal range: 23–85 U/L), serum carcinoembryonic antigen was elevated (77.46 ng/ml; normal range: ≤3 ng/mL), and serum CA19.9 level was high (581 U/ml; normal range: 0–37 U/ml). She underwent laparotomy with the clinical diagnosis of a pancreatic cystic neoplasm. Peroperatively, a large cystic mass of 15 cm × 10 cm was seen in the retroperitoneum, posterior and inferior to the pancreas, but separates from it. During surgery, the cyst showed adhesions and ruptured while removal. The cyst contents were hair and 1 L of thick fluid. The specimen was submitted for histopathological examination with a clinical diagnosis of dermoid cyst. The gross specimen received was in multiple pieces, largest measuring 12 cm × 9 cm × 1.5 cm. Other fragments were necrotic tissue together measuring 5 cm × 6 cm × 2 cm. Cut section showed yellowish to light brown areas and hemorrhage with attached hair and pultaceous material. Microscopy showed a thick cyst wall with dense inflammation, cholesterol clefts, and devoid of lining epithelium. Calcifications and hair shaft were seen embedded in the cyst wall [Figure 1]a. The solid whitish tissue showed a neoplasm composed of cells arranged in papillary and glandular pattern with lymphovascular emboli [Figure 1]b and [Figure 1]c. Poorly differentiated areas of the neoplasm with cells having vesicular nuclei and prominent nucleoli were identified [Figure 1]d. Stroma showed desmoplasia and inflammation. There were extensive areas of necrosis. Teratomatous elements other than hair were not seen after extensive sampling. A final diagnosis of moderately differentiated adenocarcinoma arising in a retroperitoneal teratoma with evidence of ischemia was given. Teratomas are the most common type of germ cell tumors. They are classified into mature (benign), immature (malignant), and monodermal (highly specialized) teratomas. A mature teratoma consists of an adult-type well-differentiated tissue, while an immature teratoma consists of immature elements, similar to those seen in embryonic or fetal tissue. Retroperitoneal teratomas comprise about 4% cases of all teratomas and 1%–11% cases of primary tumors of this site., The most common age groups affected are infancy and early adulthood. They are twice more common in females than in males. Due to their deep location, these tumors can attain large size and present only late., Our patient was a female who presented at a later age. Most retroperitoneal teratomas are asymptomatic, while symptomatic cases present as abdominal distension, abdominal pain, nausea, and vomiting. Radiological imaging is useful in the diagnosis of retroperitoneal teratoma. A CT scan or magnetic resonance image can identify various components such as bone, soft-tissue density structures, adipose tissue, sebaceous, and serous-type fluids. The differential diagnosis of a retroperitoneal mass includes neoplastic and nonneoplastic lesions. Neoplastic lesions are mature teratoma, mucinous cystadenoma, mesothelioma, lipoma, liposarcoma, paraganglioma, ganglioneuroma, and other rare sarcomas. Nonneoplastic lesions include lymphangiomas, Müllerian cysts, epidermoid cysts, pancreatic pseudocysts, lymphoceles, urinomas, and hematomas. Gonadal (ovarian and testicular) teratomas should be excluded in all suspected cases as retroperitoneal masses can represent metastatic deposits from a gonadal tumor. Ultrasound is useful as it rules out a primary or coexisting gonadal germ cell tumor. In male patients, retroperitoneal teratomas can have associated precursor testicular germ cell tumors in 50% cases. Malignant teratomas can be immature teratomas, teratomas associated with other germ cell tumors, or teratomas with malignant transformation (TMT). TMT is extremely rare; risk of malignant transformation is 1%. TMT can be classified as a natural or secondary event. Natural, when it develops de novo, and secondary cases follow treatment by radiotherapy or chemotherapy for the malignant germ cell component in a mixed germ cell tumor. The natural type of malignant transformation which occurs in older age patients with long-standing teratoma has good prognosis if completely resected. The molecular pathology of these two groups appears to be different. Most common malignancy arising is a somatic nongerm cell tumor – squamous cell carcinoma. Adenocarcinoma arising in teratoma is an uncommon but well-described entity. Variants of adenocarcinoma such as signet ring cell type, mucinous, intestinal, and enteric are documented to arise in a retroperitoneal teratoma.,, Recent published data on retroperitoneal teratoma with somatic-type malignancies are compared with our case in [Table 1].,,, Seven out of the total eight cases are reported in females. The age of patients ranged from 27 to 73 years, and the mean age for presentation was 44 years. All cases presented with abdominal pain and swelling, and the outcome of the disease was poor in half of the cases. Our case report was in parallel with the above-mentioned studies. In addition to malignancy, other complications that can arise are torsion and rupture of the tumor. If the tumor ruptures, sebaceous material can spill into the abdominal cavity causing shock or granulomatous reaction with adhesion formation. TMT requires complete resection, as these tumors are chemoresistant and recurrence is common in cases without complete surgical removal. The prognostic factors of retroperitoneal malignant teratoma are not clearly defined. The prognostic factors of ovarian TMT can be useful and include cyst wall and local invasion, rupture, tumor dissemination, and metastasis. The deep location leading to a delayed diagnosis and resectability of the tumor also determines the prognosis. In tumors which are completely resected, 5-year survival rate is 100%. In our patient, there was incomplete resection and tumor rupture during operation suggesting a poor prognosis. In retroperitoneal tumors, suspected teratoma, we should always exclude the possibility of somatic-type malignancy (nongerm cell malignancies), especially when tumor is of large size in a middle-aged patient. I would like to acknowledge the professor and HOD, Department of Pathology, Dr. Usha Poothode, for her support and guidance. Mathur P, Lopez-Viego MA, Howell M. Giant primary retroperitoneal teratoma in an adult: A case report. Case Rep Med 2010;2010:3. [Doi: 10.1155/2010/650424]. Tiu A, Sovani V, Khan N, Hooda S. Primary retroperitoneal mature cystic teratoma (dermoid cyst) in a 51-year-old male: Case report and historical literature review. SAGE Open Med Case Rep 2017;5:2050313X17700745. Morinaga S, Nomori H, Kobayashi R, Atsumi Y. Well-differentiated adenocarcinoma arising from mature cystic teratoma of the mediastinum (teratoma with malignant transformation). Report of a surgical case. Am J Clin Pathol 1994;101:531-4. Kim JH, Lee TS, Oh HK, Choi YS. A case of mucinous adenocarcinoma arising from retroperitoneal teratoma treated with chemoradiation. J Gynecol Oncol 2009;20:126-8. Chu PY, Teng TH, Lee CC, Chou YY. Adenocarcinomas arising from primary retroperitoneal teratoma in an adult female patient. Int J Urol 2006;13:1352-4. Hong W, Dumoff KL, Torigian DA, Bing Z. 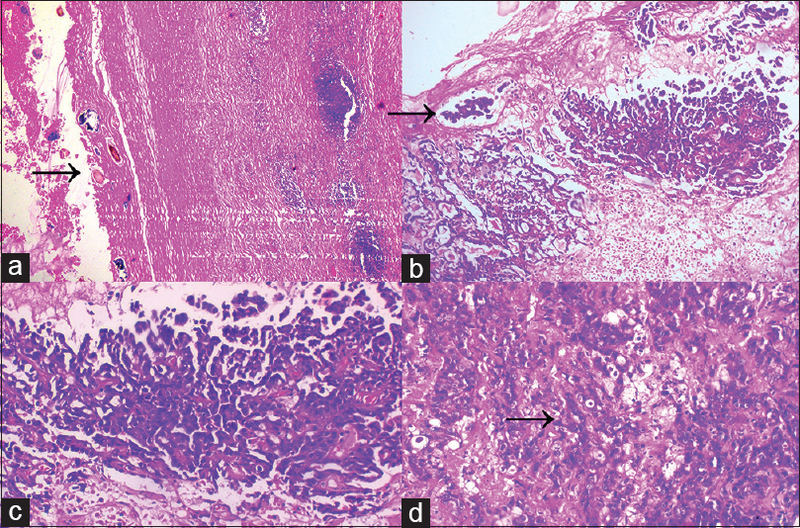 Primary retroperitoneal mature cystic teratoma with focal enteric type adenocarcinoma in a post-partum woman: Report of a case with literature review. Rare Tumors 2013;5:e1. Song ES, Choi SJ, Kim L, Choi SK, Ryu JS, Lim MK, et al. Mucinous adenocarcinoma arising from one retroperitoneal mature cystic teratoma in a postmenopausal woman. J Obstet Gynaecol Res 2005;31:127-32. Cheung WL, Cao D. Colonic-type adenocarcinoma arising in a primary retroperitoneal mature cystic teratoma. Pathol Int 2008;58:792-6. Terado Y, Kurata A, Ishida T, Imamura T, Sakamoto A. Adenocarcinoma of small intestinal type in retroperitoneal mature teratoma. Pathol Int 2010;60:701-5. Ghosal SR, Das S, Maji A, Dey KK, Bagchi D. Adenocarcinoma in retroperitoneal teratoma. Indian J Surg 2013;75:33-5.